Are real human relationships an outdated, old-fashioned idea in today’s technology-driven marketing world? 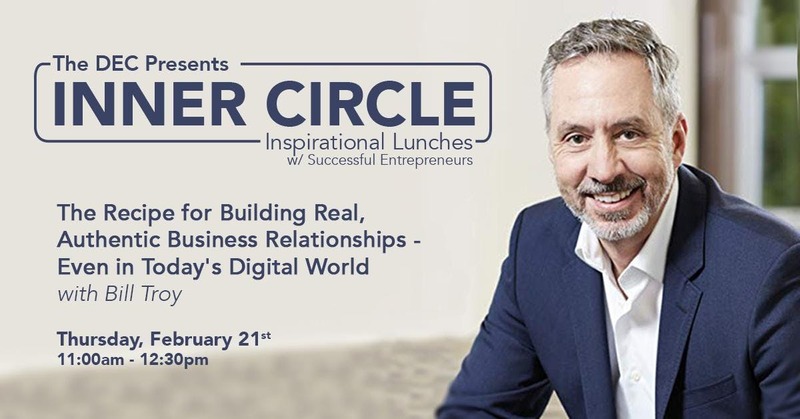 Join us to learn how human connections are more important than ever—and get the recipe for building and nurturing them with a consistent, predictable business process. Speaker: Bill Troy, Chief Executive Officer, Civilis Marketing Bill Troy is an Inc. 500 CEO and a natural-born contrarian who has helped global brands like Sony, Disney and Nestle see the world from a different perspective for 25 years. Bill’s book, CLICKSAND: How Online Marketing Will Ruin Your Business (And The Unlikely Secret To Saving It), is an explosive wake-up call and warning for business owners about the dangers and hypocrisy in online marketing. As CEO of Civilis Marketing, Bill and his team help clients drive growth through the company’s unique REALationships program, a systematic process for building and nurturing authentic, high-value individual business relationships. *Please note this event is open to DEC tenants only.